Join us at the 7th Annual Reel Fun Film Festival! We are thrilled to be hosting our 7th Annual Reel Fun Film Festival in Calgary! The Reel Fun Film Festival's mission is to expose children and youth to the world through films and the film making experience! Join us at any (or all) of our many events - starting February 2013. Join us for our special 20th Anniversary screenings of the family classic Cool Runnings this February, and meet some of the stars and athletes from the film! Join us for another very special screening event in partnership with the New Music Foundation (formerly Cantos). We are extremely excited to present another classic film from the silent film era - with a live musical score! 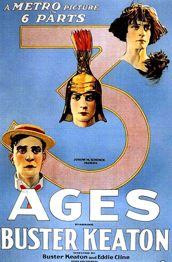 We will be showing Buster Keaton's Three Ages (1923) with the amazing accompaniment of Chris Maric. Don't miss this rare opportunity to see a classic movie they way it was originally viewed! Click here to learn more about this special screening.